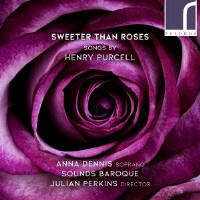 Soprano Anna Dennis hasn’t got the classic Purcell voice. Look through the composer’s discography and you’ll find Emma Kirkby, Barbara Bonney, Carolyn Sampson, Nancy Argenta – brighter, lighter, more nimble voices all. But the soprano’s oaked tone and more thickly painted vocal lines bring an attractive shift of perspective to this, her first solo recital disc. It’s an interesting selection of songs. Dennis and her collaborators Julian Perkins and Sounds Baroque have avoided many of the big hits in favour of a quirkier programme. We do get ‘An Evening Hymn’ (dispatched rather matter-of-factly, and at fairly brisk pace), ‘How blest are shepherds’ from King Arthur, and of course the title-track, whose sudden mood-shifts and more expansive, arioso-like form suit Dennis better, but beyond that we’re into the more unusual territory. Dennis’s lower centre of vocal gravity anchors a wonderfully brooding and inky ‘In the black, dismal dungeon of despair’ and brings warmth and weight to Henry Lawes’s ‘No Reprieve’, with its heartbreakingly desolate refrain ‘Alas! Undone to fate, I bow my head’, and the soprano’s superb diction and attention to text bring a lovely lightness to the vivacious ‘Cupid, the slyest rogue alive’. But the delivery never feels quite as relaxed or released as Sampson (BIS, 12/07; and also Wigmore Hall Live, 9/16) – still the benchmark here for ease and thoughtful inflection. It’s the instrumental contributions that really make the disc. Perkins’s harpsichord offers sparkling commentary in ‘She loves and she confesses too’, vamping up the ground bass to almost Nyman-like intensity. Giovanni Battista Draghi’s Suite in E minor gets similarly loving treatment, its short movements all carefully coloured, while James Akers makes a highlight of Francesco Corbetta’s Suite in C, his guitar now lute-like and delicate, now thrumming tuned percussion.